Escaped slave and confirmed bachelor Adam Clayborne finds his convictions faltering when Mama Rose summons irresistible former slave Genevieve Delacrois to Montana, where the beautiful young woman teaches Adam the meaning of true freedom. Original. The Claybornes are back -- and love is in bloom! First introduced in Julie Garwood's magnificent New York Times bestseller For the Roses, which inspired the Hallmark Hall of Fame television film Rose Hill, the Clayborne brothers of Blue Belle, Montana, have been embraced by millions worldwide. Now Julie Garwood spins the individual stories of these three spirited brothers -- once a mismatched gang of street urchins -- in a trio of special novels that continues with One Red Rose. Adam Clayborne has always put great stock in the power of books. As an escaped slave -- and a wanted man -- reading has been his only ticket to the wonders of distant lands. Adam is content with his life as a confirmed bachelor, which is why his Mama Rose has summoned the irresistible Genevieve Delacroix to Montana. Also a former slave, Genevieve shares his dream of seeing the world, but she arrives to find Adam unfailingly polite...and just as distant. Undaunted, Genevieve determines to teach Adam what he'll never learn from a book -- that true freedom only comes when you open your heart. 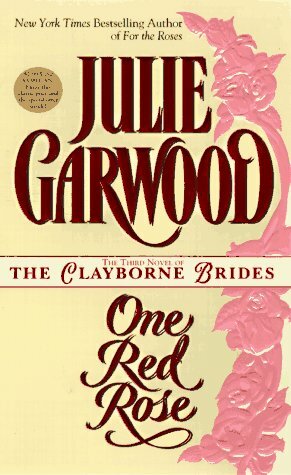 With more than 13 million books in print and 13 consecutive New York Times bestsellers, Julie Garwood has earned a solid position among fiction's established stars. It's clear why she has risen to the top -- her talent as a novelist keeps readers laughing, crying and thoroughly entertained with each new book. One force that shaped Julie's life and work is her Irish heritage. "The Irish are great storytellers who relish getting all the details and nuances of every situation. Add in the fact that in my family I was the 6th of 7 children. Early in life I learned that self-expression had to be forceful, imaginative and quick," Julie says. Julie Garwood's phenomenal success is not only a result of her outstanding writing ability, but also her determination. Her early elementary education was interrupted by illness, and as a result, she didn't learn to read until she was almost 12 years old. She's been a champion of literacy ever since -- as a tutor, a classroom storyteller and an author of two children's books. Julie visits schools as often as possible to talk to children about the joys and rewards of reading. "I treasure the written word," she explains, "and I want everyone to love books as much as I do." Julie Garwood's first historical novel, Gentle Warrior, was published by Pocket Books in 1985. Since then, her popularity among readers has grown with each new publication. She is currently working on her next novel.